Making a long-distance move is exciting, but it’s also stressful and a great deal of work - especially when you are flying with a dog or cat. If only you could explain to Charlie how great his new place will be, how much fun he'll have when he gets there, and that there's nothing to be afraid of on the trip to his new home. You may be wondering - is it even safe for dogs or cats to fly? In most cases, the answer is a clear “yes" — when you take the proper precautions. You can do a lot to make your trip easier, but omitting just one required document or failing to meet one requirement could result in unnecessary inconvenience and stress — and more importantly, possibly a long, isolated quarantine for your furry friend. Your biggest worry is making sure your buddy is safe and comfortable. (It's our first concern too!) So we’ll include many insider tips to make sure their journey is as comfortable as it can be. Have any doubts or concerns about Charlie's health? Be sure Charlie's vet checks him out. If Charlie has a chronic condition that needs medication and his flight might make regular dosing impossible — talk to your vet. We may be able to help arrange for a rest stop along the way when Charlie can get his medicine. When you cross any border – state-to-state or another country – Charlie needs to have a current health certificate. "State-to-state? Really?" you ask incredulously. Yes, really. You may never be asked to show it at a state border, but it does happen. We've known cases where hotels and motels have asked to see it (even if the state border patrol didn't). If you’re moving internationally, that health certificate is an absolute must to prevent Charlie from being turned away at your point of departure or, even worse, at your destination. The health certificate (APHIS Form 7001 in the U.S.) confirms that your pet does not present a health hazard to other animals or humans. If you’re moving to another state, your vet will probably have the paperwork you need on hand. Any international move (or a move to Hawaii) requires you to learn the specific requirements of your destination and then work with your vet to meet them. This Health Certificate almost always needs to be completed within 10 days of travel, but some countries require that it be done even closer to the travel date. Note: some tests can take months to complete (due to lab incubation time), which is why it’s so important to start this process as soon as you think you may be flying with a dog or cat. 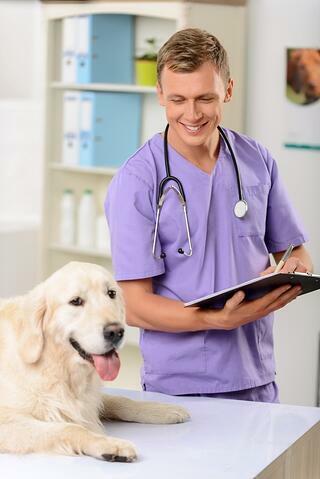 Many private veterinarians in the U.S. are accredited by the U.S. Department of Agriculture (USDA) – in effect they are deputized to work cooperatively with state and federal vets and animal health officials. Many countries require that the vet who completes Charlie’s health certificate be “accredited,” which could be defined as an official veterinarian, competent authority, or issuing authorized veterinarian. (Get help finding a USDA accredited vet in your state.) Your vet will examine Charlie, perform any additional work such as vaccinations or tests, complete the forms and sign them. Then you give the forms to a Veterinary Services District Office (VSDO) for review and authentication. They don’t need to see Charlie, just his paperwork. You can bring the forms in person, or send them with a prepaid return self-addressed envelope. There’s a small fee involved, which you’ll pay to the VSDO when they endorse it. Along with the Form 7001 and country-specific certificate (if needed), you also have to provide any supporting documentation when required. This could include Charlie's signed original rabies vaccination certificates and the original laboratory results report. (Lab results may also be faxed directly from the lab to the VSDO. Although the USDA's APHIS Form 7001 is used throughout the U.S. as an “exit” health certificate, that doesn’t mean it’s the certificate your destination country uses for pet import. There may be an additional country-specific form you’ll need to complete. Check with the local USDA office or the website that the destination country has set up regarding the importation of pets. Depending on the country, he may also need his microchip number on these forms. Timing is important when flying with a dog or cat. Find out as early as possible all the information you'll need, because Charlie may need extra vaccinations (or tests) that must be verified on his health certificate. Some of these tests may take quite a while. And there's that lovely Catch-22 — vaccinations can be too old, or too new, at the time of departure. Still other requirements may have to be met well in advance. If you miss these windows, Charlie won't get his endorsed health certificate in time to travel as you plan. Many countries have quarantine laws. Most of these quarantine periods are fixed and range from 10 to 30 days if all paperwork and vet checks are in place. Look for information pertinent to your destination country on the APHIS International Regulations (IRegs) page. Scroll down to the drop-down menu and select your destination country. Rules and forms change from time to time. Double-check to be sure you've got the most recent information. Your vet may already have the forms. She’ll probably have the number to call the nearest Veterinary Services District Office if you have questions. If you and Charlie are traveling to a foreign country, you may need a country-specific import permit in addition to the other documentation we talked about above. If Charlie doesn't have all the proper paperwork, he may be refused entry or have to spend more time in quarantine. Your airline should be able to provide some information on required papers, because the destination country’s rules affect their pet travel policies. 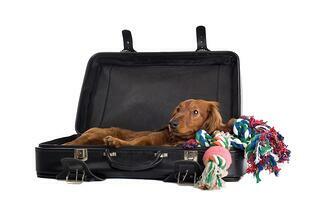 You can also check USDA's International Regulations for Pet Travel. You can usually find downloadable import forms on your destination country’s official website in addition to complete country-specific pet health requirements. Or visit its nearest consulate or embassy to pick up the paperwork yourself. (They may even mail it to you.) Documents specific to a particular country will usually tell what you need to complete the forms. No matter where you’re headed, a rabies vaccination is necessary. For most foreign countries, Charlie’s rabies vaccination must be at least 30 days' old, but less than one year. That means if he received a 3-year vaccination more than a year ago, he will need a booster shot to meet the timing requirement. These shots must be administered at least 21 days, but fewer than 365 days, before you apply for your pet’s import permit. The UAE also requires a blood test. If you’re traveling from the United States to Great Britain, requirements fall within the Pet Travel Scheme for “approved countries” (European Union countries, the U.S. and a few others). Charlie’s rabies vaccination must be at least 21 days' old, but it cannot be more than a year old. He must also have had a tapeworm treatment shortly before travel. There is a mandatory 10-day quarantine for pets entering the country from the U.S. At least 180 days prior to entering quarantine, both cats and dogs must have a blood test that shows a “passing” result. 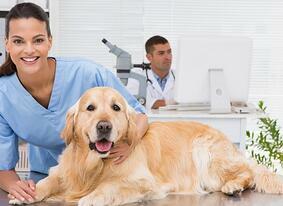 Dogs also need additional blood tests. Both cats and dogs must also have other standard vaccinations. If you’re entering Australia from somewhere other than the U.S., the quarantine requirements can possibly be considerably longer and more complex. These are just a few examples of the vaccinations Charlie may need. Make sure you do your research! 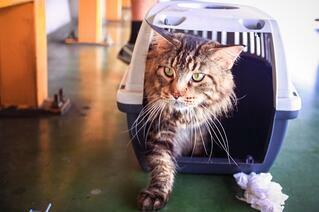 If Charlie is traveling by air, especially to another country, chances are he will need a microchip. Some countries go so far as to specify that the chip must be the newer RFID type of chip. Your vet can implant a microchip quickly and simply. Some animal shelters also provide this service. The microchip, which is about the size of a rice grain, is pre-loaded in a special syringe, and is inserted under the skin between the shoulder blades. The cost is usually less than $50. His unique microchip number must also be recorded on all the pet documents you acquire for travel. If necessary, the microchip can be scanned and the numbers can be compared to prove Charlie is really yours and the health documents are really his. Obtaining some documents can take up to six weeks, so starting the process early is crucial. Using an international pet transport company can take much of the headache out of gathering all the necessary documentation and timing things just right. You’ll also save hours of online research, phone calls, and office visits. More importantly, you'll rest easier knowing all the correct documentation is in place, making Charlie’s travels comfortable, safe, and anxiety-free. You may be feeling anxious about Charlie’s upcoming trip. It would be nice to be able to get a text from him along the way, wouldn’t it? While your airline can’t provide you with feedback during the flight, you might feel less nervous if you track his flights on the airline’s website. When you book with a pet transport company like Starwood, you get an itinerary in advance and will get updates during the trip. We almost always send photos of your traveling pet! 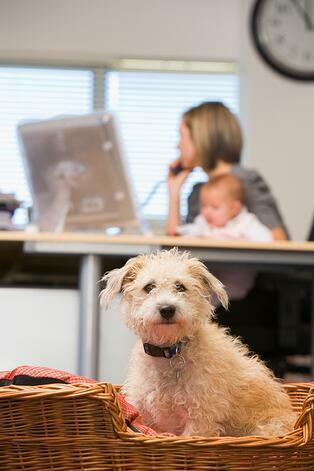 In the hustle and bustle of packing and moving, it's easy to take our pets (and kids!) for granted. Don’t let these distractions leave Charlie (or your kids) feeling left out. Even though you’re busy, make sure his feeding stays on schedule and any other pet routines stay on track. Mark off some time to have some fun in his favorite places. Pet and play with him so he's the center of attention. As your anxiety escalates, so does his — he senses that. He needs your reassurance, and keeping him happy in his routine and showing your love is the best way to achieve that. Working off pent-up anxiety is good for both of you. Go for an extra-long walk, even when you feel like you don’t have the time. If possible, tucker Charlie out just before it’s time to leave. A tired dog is a happy dog! The less disruption, the better. On the most chaotic days, when you’re expecting unfamiliar people, get him away from the craziness. Arrange for Charlie to go to day care, or visit a neighbor. Take him for a long walk, or a little road trip if you can be away yourself – anything so he isn’t in the middle of all that stressful coming and going with lots of strangers. A kennel Charlie can identify with as “his” will really help. Since you’re required to use an extra heavy-duty IATA-approved kennel to ship any dog or cat as cargo or baggage, research what you need and get the kennel at least a month before you plan to depart (longer if possible). Let Charlie sit in it, sleep in it, etc. so it picks up his scent and yours. Put some newspaper or a favorite lightweight blanket of his in the bottom, so it’s more comfortable and smells like home. 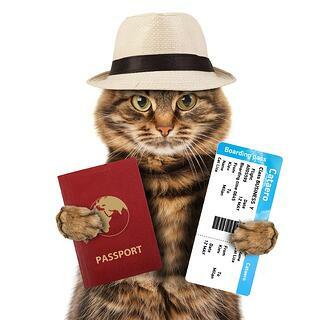 Every airline has its own rules for flying with a dog or cats, and every country has its own pet health requirements. Dogs and cats without proper documentation – all of it – may not be allowed on board and will almost certainly face rejection, quarantine, or other consequences when they arrive. This is the last thing you or Charlie need emotionally, physically, or financially. Although some airlines allow you to tranquilize pets prior to air travel (with a letter of permission from your vet), don’t do it. The American Veterinary Medical Association strongly recommends against it, and reputable pet shipping companies will not accept pets that have been sedated. That may seem counterintuitive – after all, you want your four-legged friend to be as relaxed as possible under stressful conditions. But the fact is, sedation puts Charlie at a significant disadvantage. It makes him more confused and fearful, not less. Tranquilized animals have decreased muscle control. They can’t maintain balance as the carrier is being moved around. Charlie could inadvertently injure himself when trying to stand up or turn around. He'll be far better off if you take other steps to prepare him for his flying experience. Sedatives will wear off. Having Charlie “come to,” only to find himself in a completely foreign environment without you, will add to his stress. Let him have a clear head and respond appropriately given his confined space and strange surroundings. He can handle it, and will be much better off when you’re reunited. Just because Charlie might travel in his carrier under the seat in front of you doesn’t mean you don't need a leash. You'll need to remove him from his carrier at security. The last thing you want is for him to escape at the airport! You'll also want to visit the airport’s pet relief area, especially if your itinerary involves multiple flights. All Starwood drivers have their own leashes, so you would not have to provide one for transport. This article is a great start, but be sure to research even more by reading airline information, pet travel blogs, country-specific websites, and comments and testimonials from pet parents who’ve been there. Realize that not everything you read will be accurate or current, but the more perspectives you get, the better prepared you'll be for flying with Charlie. We've already talked about assembling the required paperwork, so make sure you speak with your vet immediately. You can’t afford to miss the timing deadlines, and of course — you want to be sure Charlie is fit to fly. Just be aware that a vet’s main business is to treat pets and very often they are not knowledgeable about the paperwork requirements for shipping a pet internationally. 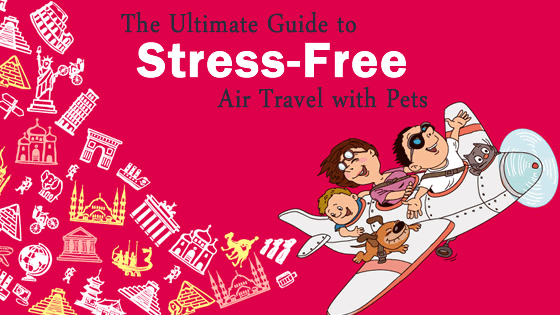 This is one of the most important things you can to do reduce your pet’s potential stress as he flies. Even if Charlie is crate-trained, chances are he’ll need a different kennel for air travel – one that meets IATA standards for extra-sturdy construction to remain safe, secure and comfortable. You want him to think of this kennel as a protective, cozy space – a place that he recognizes as his. Buy it as soon as you can so he can become familiar with it. Never use it as a place for “time outs” or banishment. Instead, encourage Charlie to play in it, eat treats in it, snooze in it – whatever it takes for him to get comfortable. And speaking of comfortable, you’ll want to line the bottom of the kennel for travel with something soft and absorbent (in case of an accident). Use Charlie’s own small blanket or a towel or T-shirt that smells like you to further reduce his potential anxiety. We'll go into more crate specifications later on. If you read pet-related blogs or other information online, you may find a variety of opinions on this subject. However, most airlines and veterinarians recommend aiming for the high end of that time frame -- feeding him the full four hours ahead of time, or certainly not less than two hours before the flight. The reasons are simple. Despite your best efforts to reduce your and his pre-flight jitters, he’s probably not going to be entirely relaxed. Having a full stomach simply gives his body one more thing to deal with. He could become nauseated, and that will make him even more anxious. Besides, he’s not going to starve to death even if his flight takes all day. We all know hydration is important, for pets as well as people. You don’t want Charlie to be so water-logged he has to “go” while he’s in transit, but do offer him a little water before departure, and be prepared to offer him as much as he wants once you arrive at your destination. During the flight, his water dish must be attached to his kennel, so it’s available to him on the interior. Many vets and others suggest you partially fill the dish and freeze it ahead of time. That way water won’t spill as he’s is being loaded into the plane. Instead, as the ice melts during the flight, he’ll have ready access to a sip. It may seem strange, but if Charlie will be flying because you’re moving for your job, his travel-related expenses are likely to be tax-deductible along with your other moving expenses. So ask about this before you make any decisions about how to handle the big move. This isn’t always possible, but the less elapsed time Charlie spends in transit, the less stressed he'll be. Multiple flights that require plane changes increase his “seat time” in the kennel and possible wait time on the tarmac — where the weather and noise may cause a great deal of added stress. A professional pet transport expert can help you make the most efficient flight arrangements for him, choosing the best airline as well as the best itinerary. In-cabin travel is not possible on all flights or for larger dogs, but riding in the cabin is sometimes considered safer for snub-nosed pets. The cargo hold for pets is a special area pressurized and temperature-controlled like the cabin, but at high altitudes, pets with short snouts may still have more difficulty breathing. In addition, most pet owners would prefer to keep their pets with them when possible. And truth be told, Charlie would prefer it too! It’s not easy to remain calm when you’re juggling all those maddening moving activities. But Charlie picks up every nuance of your behavior – sometimes he can read your mind, right? So you owe him extra effort during this busy time. The less frazzled you are, the less anxious he will be. Spend plenty of time with him, playing, taking walks and simply hanging around. Do everything you can to maintain his regular routine for as long as possible, so his life isn’t entirely disrupted by your preparations for moving. And recognize that he may act out his concerns by being more reclusive or clingy than usual – that’s simply his way of processing everything that’s happening around him. Choose one where arranging pet travel is their only business. They are your most reliable source for accurate, up-to-date information. And thanks to their extensive experience you can get tips and advice you won’t find elsewhere to make Charlie’s journey as smooth as possible. Besides, some airlines and countries require you to use a professional shipper for pets. They have your back. You’ll learn as you study up on pet air travel, there are many variables in play, some of which you cannot control. Whether you’re traveling with Charlie or you’re waiting on the ground for him, once the process is underway you cannot be present to step in if needed. They can. There are countless pet carriers on the market, designed for Charlie to use at home, or in the car. Some are stylish, some are personalized, some are downright luxurious. But when it’s time for your four-legged friend to take to the air, the carrier he travels in becomes more than a fashion statement. It has to keep him safe and secure and make him as comfortable as possible, in conditions very different from your home or vehicle. Every airline adheres to the pet carrier requirements established by the International Air Transport Association (IATA). That means Charlie can't fly unless he’s in an approved IATA kennel. There’s a size for every pet, and he must be in the right-sized kennel. You cannot simply “eyeball” this. You may think your pet won’t mind being a little hunched or scrunched – after all, bigger kennels cost more – but the airlines won’t go for that. Charlie must be able to stand or sit fully erect, easily turn around and lie down in a natural position within the kennel. Short-nosed breeds must be allowed additional space to allow for ample breathing room — literally. D = Height in a natural standing position from the top of the head or the ear tip, whichever is higher (neither can touch the top of the crate). Height = D + 3"
Only puppies or kittens can double up in one carrier. Construction — may be rigid plastic, wood, fiberglass, or metal. The roof and floor must be solid, and the door must constitute one entire end. All-mesh or collapsible containers do not meet air travel requirements for safety or security. There must be ventilation on three sides for domestic travel and four sides for international travel. 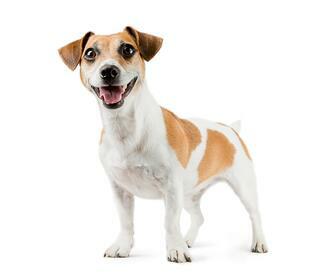 No part of your pet – nose, toes, or tail – can protrude from the kennel. Every attachment hole in the top and bottom must be secured with metal bolts and nuts. The interior must be entirely smooth, with no protrusions that could injure or be chewed on. There must be two dishes secured inside the kennel, but accessible from the outside, to provide food and water in the event of a travel delay. The door must latch securely, in a way that smarty-pants Charlie cannot undo. Ventilation must be at least 16% of the total surface area of the kennel’s four sides. Therefore, side and rear walls must have openings at least 1” wide across the upper two-thirds. The roof may be ventilated, too. If the combined weight of the kennel AND Charlie totals over 132 pounds, the carrier must be forklift-compatible. Some airlines have their own rules in addition to the IATA standards, so it’s a good idea to check with your carrier before purchasing his kennel. For instance, United Airlines requires pets flying internationally to have 3” interior clearance when standing, which is more than IATA’s “no touching the ceiling” rule. Also, some airlines require kennels to be accessible in case of an emergency, while others require incoming pets to be in “sealed door” kennels to validate health certification status. If your pet will be riding on board with you, you have more options when it comes to carriers, but measurements can be tricky. Just because Charlie fits in the carrier doesn’t mean the carrier will fit under the seat in front of you. Space allocation differs from one airline to another. It is essential to ask about the exact dimensions for the type of plane assigned to your flight(s). Then measure your carrier carefully -- you can’t just stick poor Charlie in the overhead bin instead! Even if you already own a hard-sided carrier for trips to the vet or other places around town, consider a purse-style carrier for your flight. These bags are soft-sided, so they are more comfortable for Charlie, and the shoulder strap makes hauling him around more comfortable for you, too. Soft sides also make it easier to mold the carrier to fit under the seat. Booking a flight with Charlie will be a bit more complicated than when you’re traveling solo. For one thing, not all airlines allow pets. Those that do have differing policies and limitations, and they don’t all offer the same options. 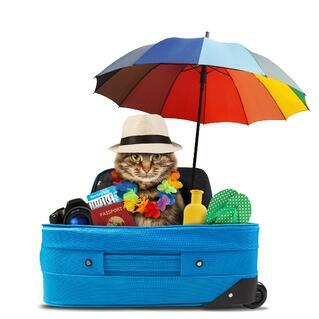 Here are some questions to ask when deciding which pet-friendly airline best fits your needs. Does the Airline Carry Pets to your Destination? Many pet-friendly U.S. airlines serve a wide range of cities across the country and internationally. But that doesn’t mean they can take pets to every destination. Smaller planes have less cargo room, and in some cases large and extra-large dog kennels literally do not fit. You may have to choose a different airport for departure or arrival, or you may have to use more than one airline to complete Charlie’s itinerary. Where Can your Pet Ride? Most pet-friendly airlines allow cats and dogs that are small enough to ride in the cabin, under the seat in front of you. 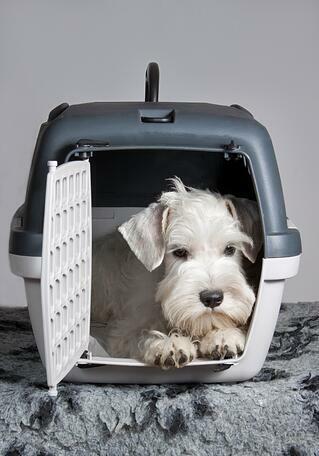 All cats and dogs can also travel as cargo, in a special compartment that is pressurized and temperature-controlled. If you’re traveling on the same flight, you can make reservations at the same time, but you’ll need to drop Charlie off at the cargo terminal (unless you’re taking him on board). Some airlines allow pets to travel on the same flight with you as checked baggage instead of cargo – the required kennel and other rules are the same, but you can all check in at the “human” terminal. Does the Airline Restrict Certain Breeds? Pet-friendly airlines care about the safety of your dog or cat. Because snub-nosed pets are naturally inclined toward breathing problems, some airlines will not take them at all, or they require these dogs and cats to fly only in the cabin. If Charlie is a Boxer (or a Persian), he may be out of luck, and you’ll need to find a different airline unless they allow him in cargo. Fees vary by airline, too, although in-cabin rates are typically considerably less expensive. International moves are filled with complexity, details, and well — stress! If you are flying with a dogs or cat you may want to take advantage of a full door-to-door transport service rather than trying to do it all yourself. After all, getting dogs and/or cats organized and off to the airport, along with the rest of your family, is not a walk in the park. Most often, cargo terminals are located away from the regular terminals, and check-in timing differs from airport rules for humans. Bottom line: you can’t be in two places at once. Consider using an animal transportation pro and let them sweat the details, so you can relax, knowing your pets are in the best of hands. Request a free quote from Starwood Animal Transport. You don’t have to do this alone. We're here to help. Get more comfortable with the process by watching the journeys of the thousands of pets we have helped move over the past 10 years. Every day is another heartwarming story when you follow us on Facebook. Get tips for moving and loving the expat lifestyle on our Pinterest boards. Most of all, we wish you the best in your travels!